7.13 points at 23 votes (rank 321). The pawn has to climb down into an underground dungeon and search for a sword between the fifteenth and twentieth level. He shall hand over this "Sword of Fargoal" to the blind knight Gedwyn, so he can fight the devilish Umla. As soon as the player has found the sword in the depths of the dungeon, there are about 30 minutes left to take it out. If it gets lost on the way he must return to the level where he found it. 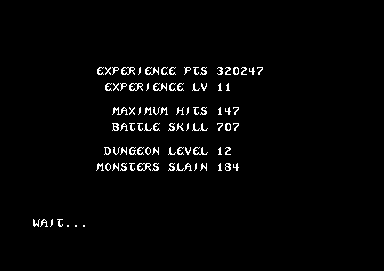 Same as in other fantasy role games, the player improves his abilities by collecting experience points. As soon as he has reached 200 experience points, the player goes up one level and his resistance against wounds is raised. The next stage is at 400, the third at 800 and so on (each twice the experience points). The treasures contained in every level can be swapped against experience points in the temple that belongs to every stage. 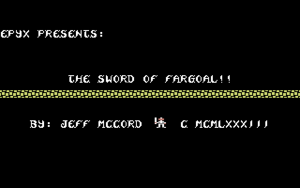 "Sword of Fargoal" is based on the game "Gammaquest II" by Jeff McCord and was originally written in BASIC for the Commodore PET. 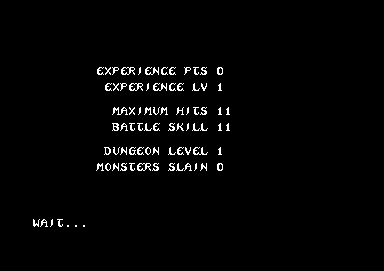 Here the concept of randomly generated dungeon levels was probably used for the first time. Every level is shown on the screen by a labyrinth-like masonry that can only be seen as far as the pawn has already explored. The fights are accompanied with sound effects. Press the joystick into the desired direction to move through the dungeon. Collect experience points by killing monsters or delivering gold to the temples. With the magic sacks you can transport more gold. Grey squares show treasures or traps. Stand on them to find out. To climb stairs stand on the stair and press the fire button. To fight the monster stand on their square. If you wait for the monsters to come to you, they have an advantage. If the fight goes bad for you, use a healing potion, teleport, spell or run away. In the temple the pawn is protected from hostile monsters. Furthermore the hitpoints regenerate twice the speed. While searching through the dungeons the player will find chests. The chests themselves can contain useful things or traps can be released. Only after opening a chest you will know what is in it. S hield Spell - The players is not harmed in the following fight. R egeneration - The hitpoints regenerate faster. T eleport - Teleports the player into a random place in the dungeon. I nvisibility - Monsters do not approach the player directly. L ight - Raises the distance of sight of the character. Is extinguished when entering a new dungeon. Can be switched of with the key O . Drift - Protects the player from falling into a trap. Is not active after the trap. It is activated by the fire button. If something "bad" happens, as e.g. a fight against a monster, which you will lose or the appearing of a dangerous trap, keep the fire button pressed. This works as a "panic"-key, i.e. it automatically activates helpful items as e.g. 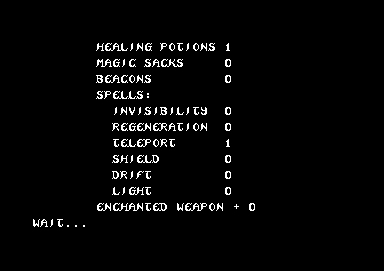 healing potions or the teleport spells that are in your inventory. Then the sword is in the inventory again and the way up can be continued. Rombach: "This game makes the bridge between action games and the fantasy role games. It is well-suited to be introduced into fantasy games. Vote: 2". Sledgie: "Funny fantasy role game. The game is fun through the simple make-up and the randomly generated levels and also the motivation stays long. 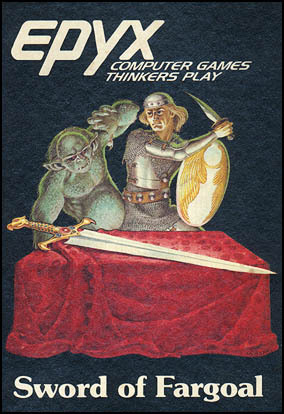 The ones who know the classics NetHack and its follower Slash'EM could almost assume a forerunner here. I gave the game 9 points." Logan: "The game is only in the emulator in the warp-mode real fun. Well, 200% speed are much better playable. In any case a cool game." Monty: "Could be really funny but is catastrophically playable. Especially in the later levels only luck decides over success or fail. Concerning the gameplay it is a rather simple game which, however, has a rather strong game depth, but the high difficulty grade destroys the whole motivation. Historically seen it is quite interesting, but concering the gameplay rather weak. Fortunately, they have done much better later with the inofficial follower "Gateway To Apshai"." Rockford: "Yes, the difficulty grade ... it already made the prime father of this type of game 'Rogue' unplayable from one level to the next. 'Sword of Fargoal' was my first contact to 'Roguelike Games', which I like playing on different platforms since then. Furthermore, this is one of the first games, where my Diablo-collecting-addiction started. Gnarl!" Shakermaker303: "First I found it very hard. If one has worked himself into it, it is definitely interesting and entertaining. The game is quite well done, but for me worth "only" 6 out of 10 points." This page was last modified on 7 June 2018, at 00:42.